Nova Scotian Thom Fitzgerald hit it big with his first feature THE HANGNG GARDEN. 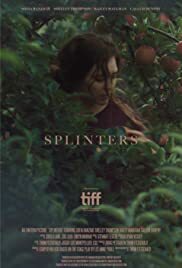 Once again, Fitzgerald again explores interconnections of sexual identity, family, and small-town Nova Scotia life, in this intimate drama about a young woman reassessing her relationship with her mother following the death of her father. The film opens with Belle returning to her town for her father’s funeral with lacklustre greetings by family and friends. Nobody is really glad to see her again, less her mother who seems to be Mrs. Grumpy from start to finish. Unfortunately, the film is about Belle’s relationship with her mother. Belle is then unexpectedly visited by Rob who is revealed to be her boyfriend. But Belle has come out before as a lesbian and is also shown in a lesbian love-making scene. It is difficult to see the reason Belle’s boyfriend Rob falls for her or what he sees in her. The story, based on the stage play by Lee-Anne Poole is puzzling and really leads nowhere, and nowhere very slowly.